Sponsorship and Advocacy Committee's are in need of some volunteers! Message from Christopher Kunney - GA HIMSS aims to coordinate and advance healthcare IT and management systems through advocacy and public policy initiatives here in the state of Georgia. We want to invite you to to join this committee and help reach its goals. HIMSS mobilizes its members around the country and seeks to perform multiple levels of outreach activities to members of Congress and their staff through a variety of initiatives, providing accurate information about health information and technology to help them make effective public policy decisions. Your voice matters! Join us to share your health IT stories with colleagues and policymakers. To learn more about HIMSS Public Policy activities and how you can participate, please visit www.himss.org/policy, and subscribe to the free weekly Health IT Policy Update e-newsletter. Hello, my name is Brandon Haynie and I am the Sponsorship Chair for Georgia HIMSS and I would like to ask for your support on this committee so that we can accomplish the fundraising goals that will provide scholarships for students, advanced training and educational events for hospital IT staff. Each committee member will have a small group of existing and target sponsors that they will be responsible for contacting and talking about the current sponsorship opportunities with. The target goal of this position would be 1-2 hours per month with the possibility of a little more around the Spring Gala. As a committee member, each person will get the opportunity to share their vision and input into this committee and give back to their community through their service to support the Georgia Chapter of HIMSS. It’s also a great path to get noticed for a position on the Board of Directors. Please click here to submit a GA HIMSS Volunteer Application. -Individual must demonstrate active participation in role that was accepted. Board Volunteer - Proven demonstration in leadership in the HIT Industry & GA HIMSS, available to chair a committee or event, support & attend GA HIMSS events as able, and attendance at each quarterly Board Meeting (Average 8-10 hours/month total commitment). Committee Volunteer - Knowledgeable in area of committee focus, demonstration of team work, reliability and active participation (Average 8 hours/month total commitment). Committee positions are available for a term of two fiscal years and are open to members who have been in good standing for 12 consecutive months. Subject Matter Expert - Speak at an event or sit on a panel. Event Volunteer - Demonstration of team work, reliability and active participation (Average 2-4 hours/month total commitment). **Who is eligible to join a committee? 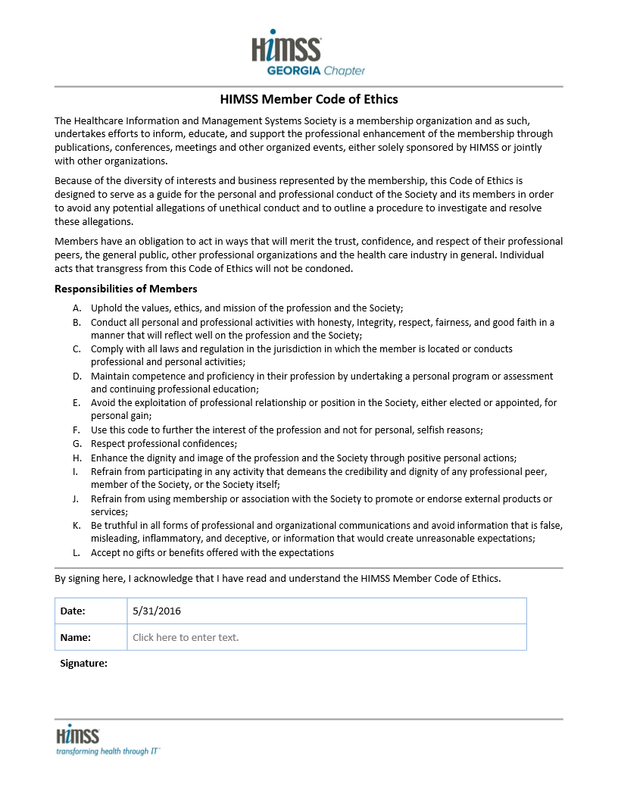 To be eligible to serve as a committee member, an applicant must have belonged to HIMSS for more than the past 12 consecutive months from the date nominations open. 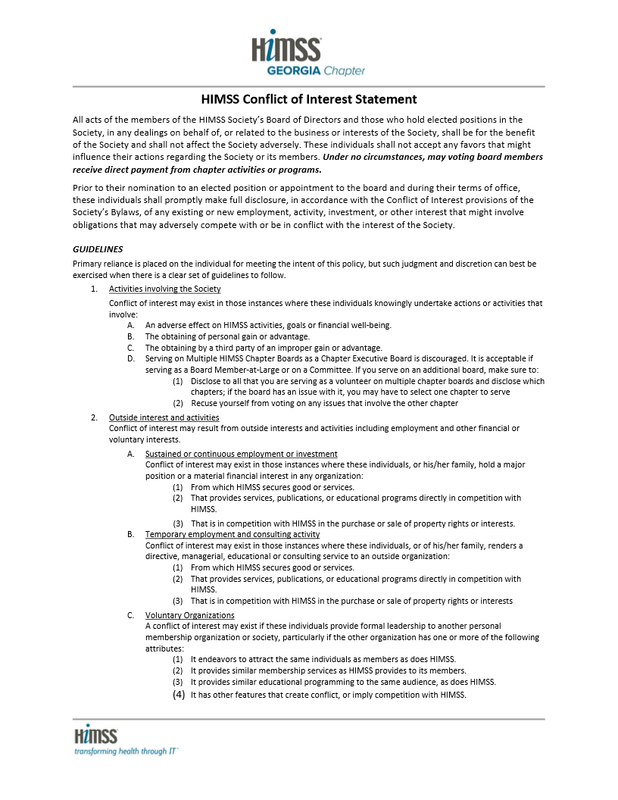 Applicants cannot be currently serving in a leadership position (ex: Committee Chair or HNA Board of Directors), nor hold a current committee appointment within the Society. Ineligible member types: Chapter only and Online only. **What is the time commitment for serving on a committee? Time commitment and responsibilities vary from committee to committee. The average time expected from a committee member is three hours per month. Each committee will hold at least one one-hour virtual meeting per month. Standard committee terms are for a year, beginning July 1 and ending June 30.